If you’ve been thinking there are a lot of new high-rises going up in NoMad lately, you’re right and perhaps there are more than you think. The neighborhood is experiencing a surge of growth and renovation, making room for a whole new influx of businesses and residents. One of the latest construction projects is slated to begin at 30 E. 29th Street—a 639-foot tall skyscraper by the Rockefeller Group, with plans and rendering that suggest strong art deco influences such as chevrons rising from bottom to top. 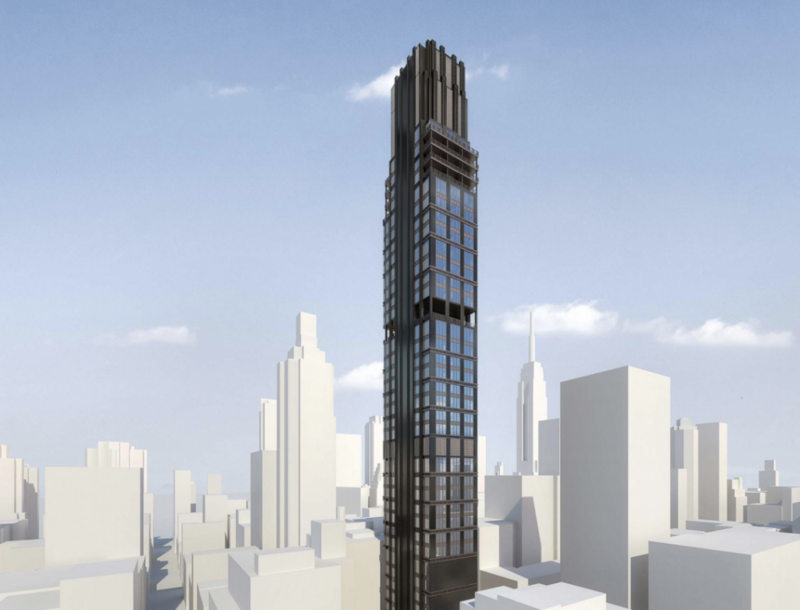 According to New York YIMBY, the new planned structure will rise 46 stories, encompassing over 226,000 square feet of usable space, including 123 residences ranging from studio to four-bedroom apartments. Features of the current plans include: larger duplexes with multiple terraces on floors 40-43: residential amenities among which are a pool, fitness center and squash court; and an entertainment space, which will be located on the 31st floor. There will also be space reserved for up to 70 bicycles. With previous structures now cleared, construction of the new building is imminent. While no estimated completion date has yet been announced, the new tower will no doubt feature prominently on NoMad’s rapidly changing skyline as it adds another interesting architectural statement to NoMad’s heritage of fine buildings.